Book reviewing, we can all agree, has lost its serrated edge. Literary critics were once legislators who ripped the masks from charlatans and hailed our future leaders, but today’s reviewers are more concerned with watching their backs than sharpening their pens. The bloodbath has become a featherbed. Two centuries ago, in the glory days of the literary magazine, the critic was regarded as a superior being. ‘This will never do,’ thundered Francis Jeffrey of Wordsworth’s The Excursion. Jeffrey was writing in the Edinburgh Review, which invented the review-like essay and the essay-like review. 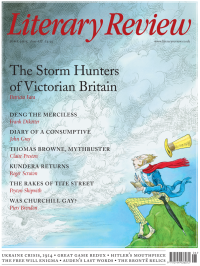 Edinburgh reviewers, instructed Jeffrey – one of the magazine’s founders – must go beyond the ‘humble task of pronouncing on the mere literary merits of the works that came before it’. As such, the Edinburgh house style became known as ‘slashing’ and the effect on readers was electrifying. Given the solar system to assess, joked Sydney Smith, the Edinburgh Review would conclude that it showed ‘bad light – planets too distant – pestered with comets – feeble contrivance – could make a better with great ease’. Critical misjudgements aside, parody, personality and headlong jollity summed up the Blackwood’s manifesto, while imitation, masquerade and double bluff lay at the heart of its personality. The contributors, who hid behind noms de plume, imitated both one another and themselves, and passed themselves off as sometimes real and sometimes fictitious characters. The engine behind all this high jinks was a mountain of a man called John Wilson, who adopted the persona of the doddery Christopher North, Blackwood’s gentle editor (wisely, William Blackwood kept himself hidden). Behind his facade, Wilson could anonymously abuse his friend Wordsworth and, in a later issue of the magazine, write a letter of complaint against himself for libelling so great a poet. John Wilson was, said Thomas De Quincey, his boon companion, the ‘very sublime of fun’. The squabash and bam of Blackwood’s came to the boil in the ‘Noctes Ambrosianae’, which ran from 1822 until 1835. In this series of comic sketches, penned in the main part by Wilson, the pseudonymous contributors were depicted supping in the Ambrose Tavern (a real place) while they discussed the issues of the day and, mainly, the workings of Maga itself. Together with North, the diners consisted of ‘Morgan Odoherty’, modelled on a lethal Irishman called William Maginn, ‘The Shepherd’, based on the ‘Ettrick Shepherd’ James Hogg, author of The Private Memoirs and Confessions of a Justified Sinner, and ‘Timothy Tickler’, who was Wilson’s high Tory uncle, Robert Sym (Tickler being the name of Blackwood’s dog). Walk-on parts included Lord Byron, various characters from John Galt’s novels and a German called ‘Kempfherhausen’, modelled on R P Gillies. Nothing so freewheeling or brilliant has ever been repeated in the British press. Part of the joke was that Confessions of an English Opium-Eater had initially been promised to Blackwood’s, but after a row with William Blackwood, De Quincey had taken his idea to Maga’s nemesis, the London Magazine, where Hazlitt’s ‘Table-Talk’ and Lamb’s Essays of Elia were currently appearing. It was a provocative gesture, to say the least. A few months earlier, the London’s editor, a Scot called John Scott, had accused the pseudonymous Blackwoodsmen of libelling all his friends, including the recently deceased Keats. Blackwood’s, said Scott, made a ‘common joke of common honesty’. Maga feigned deep hurt, but Scott would not retreat; there was, Wilson informed De Quincey, only one response: Scott ‘must be a dead man’. In February 1821, Scott challenged Lockhart – whom he believed to be the identity behind Christopher North – to a duel. Nine days later, aged thirty-six, Scott was indeed a dead man, shot in the stomach in the fields of London’s Chalk Farm. Pistols at dawn is a step too far, but let’s raise a glass to the great age of squabash, bam and balaam, when criticism was a matter of life and death.